When Boca alum Chris Konopka landed in Dublin back in January and began pre-season training with the fabled Irish soccer club Bohemians FC, the jersey shore native felt cautious but optimistic, not only about his own chances on making the team roster, but also about the Gypsies odds for success in their new season. Ten months later, the former Boca standout finishes his 2008 campaign with a double dose of silverware. TOMS RIVER, NJ (December 2, 2008) – When Chris Konopka landed in Dublin back in January and began pre-season training two days later with the fabled Irish soccer club Bohemians FC, the former Jersey Shore Boca standout felt cautious but also very optimistic, not only about his own chances on making the team roster, but also about the Gypsies odds for success in the new season ahead of them. Ten months later, Konopka and the Bohemian’s captured the Eircom League of Ireland Premiere Division title for a historic tenth time in an overwhelming manor and then completed the big double of Irish soccer as they claimed the 2008 Football Association of Ireland (FAI) Ford Cup in dramatic fashion. The Bohemians clinched the regular league title with a 2-1 win over last year’s holders Drogheda United on October 10, mathematically securing the top spot for the table-topping Bohs which put them clear of all potential challengers with 4 games still remaining in the regular season. 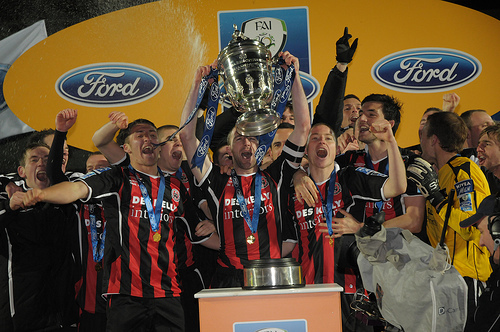 And on November 23 at the RDS Stadium Complex in the south end of Dublin in front of a near capacity crowd which included Mary McAlesse, the President of the Republic of Ireland, the Bohemians completed the double as they were victorious in the 2008 FAI Ford Cup over northern rivals Derry City. The Bohs captured the FAI Cup for the seventh time in the club’s 118-year history with a 4-2 penalty kick shout-out after a 2-2 tie through 120 minutes of regulation and overtime. Although still unconfirmed, it is believed that New Jersey’s own Konopka becomes the first American born soccer player in history to ever win the Irish double. Former Jersey Shore Boca standout Chris Konopka (in back on right side) and the Bohemians proudly accept their individual medals and the 2008 FAI Ford Cup after the Gypsies topped Derry City in a dramatic PK shoot-out at the RDS in Dublin on Sunday November 23. With the Bohs Cup victory it is believed that Konopka becomes the first American born soccer player in history to ever win the big Irish Double (Photo courtesy of Bohemians FC). “My entire time with Bohs this year has been nothing less than incredible. From my first day in camp I felt something really special could happen” mentioned Konopka who has recently returned to the United States for the off-season. During his travels and competitions with Bohs this year, Konopka also experienced the true passion of the sport that is felt throughout Europe having his passport stamped in Ireland, Spain, Northern Ireland, England, Wales and Latvia. “And I cannot say enough about the fans. The Bohs supporters are probably the most passionate and loyal of any that I have ever seen. Our trip to Wales in July for the second leg of the [UEFA] Intertoto Cup against Ryhl was evidence of that. I think over one thousand fans made the trip with us across the Irish Sea in the summer and the supporters at the Cup final were just absolutely incredible. The fans have been great and the atmosphere has been amazing all year. It has been a privilege to play for such an organization” Konopka added. 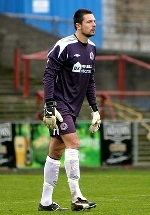 The 23 year-old Konopka, who dressed for all but one match during the Gypsies 2008 double title run, was the Bohs steady number two keeper this season behind first choice and two-time, back-to-back “Goalkeeper of the Year” winner Brian Murphy whose outstanding form all year has attracted interest from top clubs in England and Scotland. Konopka made his Bohemian first-team debut on July 1 away at Derry City going the distance in the quarterfinals of Eircom League of Ireland Cup. He also led the Bohemians reserve squad to the 2008 Eircom A-Shield Championship game against Cork City back in June and the Eircom A-League Championship final match against UCD on November 12. 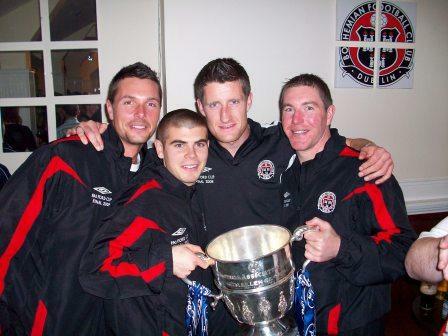 Although he did not make a first-team Premiere League appearance this season, the 6ft 5inch shot-stopper did start between the pipes in 18 other matches for the Gypsies and appeared once as a substitute during other various competitions for Bohs in 2008. He recorded an overall individual record of 13 wins, 1 draw and 4 losses in games which he appeared. Konopka impressed Bohs manager Pat Fenlon, goalkeeper coach Dermot O’Neill and chief scout Dave Henderson during his tenure this season and is presently discussing a renewal with the Gypsies. Fenlon doubles as Ireland’s U23 National Team coach while O’Neill and Henderson, also on the FAI National Team Coaching Staff, instruct the Republic’s top goalkeepers at the and U23 and youth levels. “Working with Pat, Dermot, Hendo [Dave Henderson] and Murph [Brian Murphy] all year was like training with the national team on a daily basis. It was exceptional. You showed-up every day and worked as hard as you can, then come back the next day to work even harder. I learned so much about the technical and tactical pieces of my position. And Pat instilled a first-class, no-nonsense professional attitude in everyone on the team and it paid off. Murph pushed me every day in training and I pushed him right back. I believe we helped each other during the entire season. I have definitely become a better professional” mentioned Konopka. The Bohemians are one of the oldest soccer clubs in Europe having been founded in 1890 and their home ground, historic Dalymount Park, has provided a stage for some of the world’s top footballers over the years including Stanley Matthews, Pele, Franz Beckenbauer, Bobby Charlton, Ruud Gullit, Marco Van Basten and Zinedine Zidane, as well as countless Irish and European stars past and present. Konopka spent his rookie professional season in 2007 with the Kansas City Wizards of Major League Soccer. Prior to his arrival in Kansas City, Konopka had impressive trials with English League Championship side Cardiff City and also with Charlton Athletic then of the English Premiership who were both keen on the young keeper. At the collegiate level, the New Jersey born Konopka starred for four years (2003-2006) between the pipes at Providence College in Rhode Island for Coach Chaka Daley and finished as one of the top goalkeepers in Friar history. He ranks third all-time in the most games played by a Friar goalkeeper and has the distinction of being the only Providence keeper to record a win for the Friars in the NCAA Division I Men’s Soccer Tournament. In his senior year, Konopka garnered All-Big East Second Team accolades becoming only the second keeper in Friar history to receive All-League honors. He capped his college career by becoming the first player from Providence College to be drafted by a Major League Soccer team when the Wizards selected him in the 2007 MLS Supplemental Draft. A long-time Jersey Shore Boca Soccer Club veteran, Konopka was a member of Boca’s youth system, Super Y-League, U20 and U23 teams throughout his career as well as a member of Boca’s PDL team in 2003. The Jersey Shore Boca Soccer Club is celebrating their 30-year anniversary in 2008.